November 2016, what a month huh?, well what a year right? 2016 is one of this years that never should have happened.. Now it’s first of December and soon the year will be over. Personally I can’t really complain much, not at all, but on a global level? gruesome, horrifying, frightful, shocking, unpleasant, disturbing, just to name a few. Too many good people dying, and now the next “leader” of the western world will be a racist fake smile. Well. To me this is still unbelievable and I try to do best and help people as often as I can in my environment these days. Starting off with donating blood. I try to stay positive and keep my faith in humanity to stand tall and stay loud whenever needed. People have the power to change everything. 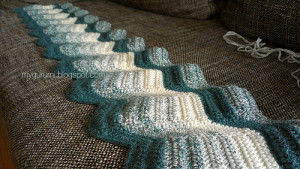 first, my Eichenlaub Blanket is finished!!! yesterday I washed and blocked it. Well blocking is not quite right, it’s too big and to my surprise it’s final rounds are not designed to be laid out flat. Nevertheless I tried my best and oh my god, I love it! I meant to write this post about three weeks ago but I was knitting. what am I knitting at the moment? well, degrees are hotter than they were all summer long and I am back at my acorn blanket. I’ve been knitting on and off for several years now. Last time last october. And now I’m actually about to finish it. Yes I mean finish, in the sense of knitting all the rows from the pattern (which are 199), plus a boarder, plus the terribly long bind off. Holy Moly! This month was fun! sometimes it was a real challenge on other days it was a blast. And I got to get to know some of you a little bit better too! How awesome is this? I want to thank you all for joining and commenting and sending hearts, it was so cool in July with you all on my instagram feed !! I know you’ve been waiting for this, my blanket grew! it took a while and even ripped it out again (yeah I knew stupid thing of being a virgo, we always wanna have things done perfectly) – I eyeballed my border stitches now that I decided to go for a “all waves face the same direction” version of my blanket. I also choose to crochet 4 rows on each color.